Official Amazon Echo (2nd Generation) Smart Speaker with Alexa. Silver metallic version. - Echo connects to Alexa to play music, make calls, set music alarms and timers, ask questions, control smart home devices, and more—instantly. - Just ask for a song, artist, or genre from Amazon Music, Spotify, Pandora, and more. With multi-room music, you can play music on compatible Echo devices in different rooms. Echo can also play Audible audiobooks, radio stations, news briefs, and more. - Call or message almost anyone hands-free with your Echo device. 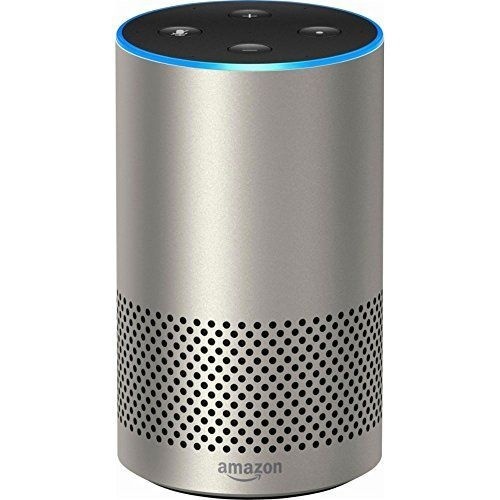 Also, instantly connect to other Echo devices in your home using just your voice. - New speaker, now with Dolby processing for crisp vocals and dynamic bass response. Echo can fill the room with 360° omnidirectional audio or pair two together for stereo sound. Adjust the treble, mid, and bass levels with your voice. - Alexa is always getting smarter and adding new features and skills. Just ask Alexa to control your TV, request an Uber, order a pizza, and more.